Cleveland.com Left, the Cleveland Indians mascot "Chief Wahoo." 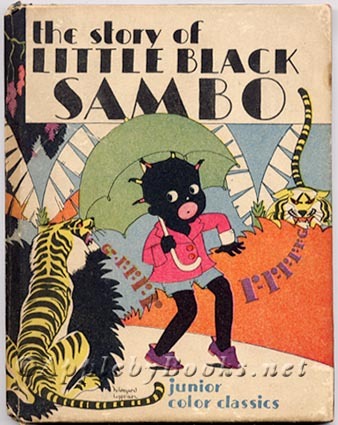 Right: Little Black Sambo. Blackhorse: 100 Years of Chief Wahoo and the ‘Grinning Face of Racism’. The Washington team is not the only professional sports franchise to feel the pressure of Native Americans and allies who seek to eliminate Native American mascots from professional sports. Native American groups and allies in Cleveland have targeted the Cleveland Indians now for more than 50 years. Today’s opening day for the team, which means there will be a demonstration. It will commence with a march at 12 p.m. Tomorrow, there will be an All Nations Conference at Pilgrim Congregational United Church of Christ in Cleveland. In the growing anti-Native American mascot movement, it seems natural the Cleveland Indians will be targeted for their name and logo. Although the term “Indian” is not viewed as a racial epithet [the term Indian has also been debated by Native people who chose not to identify with names given to them by the colonizer], like the term “redskins” their name, “Indians,” puts the identity of a race, an ethnic group, in a vulnerable position for the benefit of American entertainment. Shortly after Reed’s interview, he went before the Cleveland City Council to express his discontent with the name and logo. He reports he has the support of many city council members and the mayor of Cleveland, Frank G. Jackson. Robert Roche, left, of the American Indian Movement in Ohio, debates Chief Wahoo fan Pedro Rodriguez outside Progressive Field on Opening Day in 2014. Photo courtesy clevelandfrowns.com. I spoke to Reed recently about his decision to urge the Cleveland team to change their name and logo within the city council. Reed stated the city and other allies in Cleveland must come up with short and long term plan to phase out the logo and name. This was discussed this past Monday where he said he will bring it back to the table on April 13 during an another city council meeting. He states this is being done to put pressure on the team. Reed states the land which Progressive Field is built upon is own by the city and they have the responsibility to urge the team to eliminate their mascot and logo. “We need to let the team know that the issue still has not been resolved,” he said, referring to the teams silent ‘phase out’ of the logo chief wahoo. Reed believes the chief wahoo is being phased out and replaced with the block “C” which is used on most promotions. The team recently rebranded by using the block ‘C’ on their baseball hats and uniforms. They’ve also have been rumored to restrain from using the logo when in spring training in Goodyear, Arizona, a state that has a high population of Native Americans. The team has denied a phase out of the mascot, though. Cleveland resident Philip Yenyo, who’s Mexica – an indigenous tribe in Mexico, told me the phase out is to “appease us” meaning the Native Americans in the community who have urged for a name change for decades. Yenyo states he is not satisfied with this and for the team to make right, they must eliminate the name and the logo. Various sports writers who have identified a “phasing out” trend with the team and also report the team is not highly publicizing the celebration of 100 years of their name is because they know their name and logo will eventually come to an end. The group 500 years of Dignity and Resistance based out of Cleveland has been the group at the forefront of protesting and urging the team to change their name and logo. This group wants a change because it is the right thing to do. They are not seeking financial compensation or any other incentives. “Everyday. I see the day coming it will be gone. Lets go back to some nostalgia. One hundred years is enough,” he said. Yenyo, who has been a member of the 500 Years movement, and has been working on the issue for 24 years, added that with the recent movement on changing the name of the Washington football team, there seems to be more support on the Cleveland Indians issue. He has seen a trend in the past 24 years where people are more supportive and more open to learning. Meanwhile, Charlene Teters has been known for her work in eliminating the “chief illiniwek” at the University of Illinois but has also supported the local groups in Cleveland over the years in their protests against the Cleveland team. Charlene states she and the National Coalition Against Racism in the Sports and Media work very hard to support the local groups, but because there is not much Native presence in Cleveland it is difficult to garner support. She also states they have support, but it’s difficult for people to take the time to travel to Cleveland to show their support. “There are generations of people who have been doing this out of their back pockets. It is difficult to sustain,” she said. Reed and Yenyo both mention the impact of the Change the Name march and rally in Minneapolis in September 2014. Both want to see a rally of that magnitude in Cleveland and both are hopeful that is possible. As Yenyo and Teters reiterate, this issue will continue to be at the forefront and they will not be phased out. Amanda Blackhorse. Photo courtesy Malcolm Benally. Amanda Blackhorse, Diné, is a mother and activist. She and four other plaintiffs won a case against the Washington football team that stripped it of six of its seven trademarks. Follow her on Twitter @blackhorse_a. She lives in Kayenta, Arizona on the Navajo Nation.